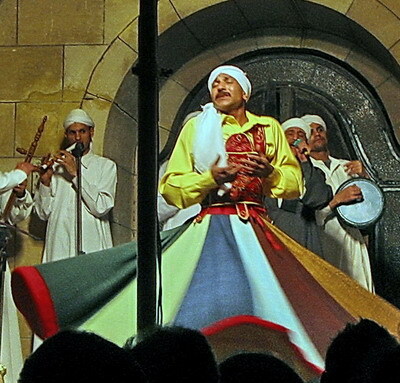 The Sufis of Egypt give free whirling dervishes performance in the heart of old Cairo, in the mausoleum of Al-Ghoury. While all Muslims believe that they are on the pathway to God and will become close to God in Paradise — after death and after the “Final Judgment” — Sufis believe as well that it is possible to become close to God and to experience this closeness while one is alive. The chief aim of all Sufis then is to let go of all notions of duality, including a conception of an individual self, and to realize the Divine unity. Not surprisingly, BANNED in some muslim countries.